TMS Software has a new version of their TMS Pack for Firemonkey available for Delphi XE6 Firemonkey. 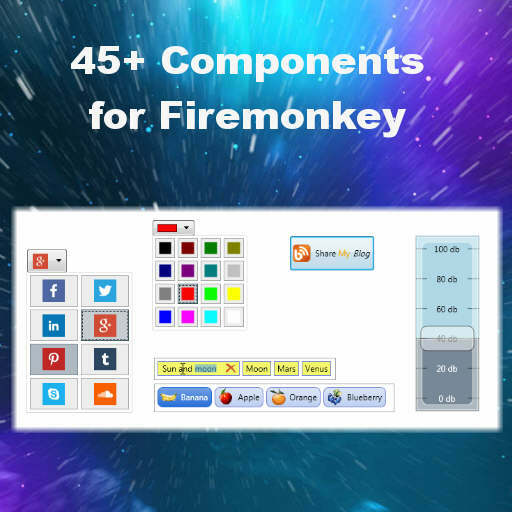 There are over 45 cross platform components in this massive Firemonkey component suite. There are 9 new components added in this version including a web browser component that is cross platform across Android, IOS, Windows, and OSX (on Windows it uses the Chromium engine). Some of the other new Firemonkey components include color pickers, a bitmap selector, a signature component, a multifunction trackbar, and a new button which supports an image and HTML text. Some of the other components included are a syntax highlighting memo component, calender components, a grid component, custom edit components with auto-completion, multiple buttons, gauges, knobs, LEDs, paging controls, and 13 different demos showing the uses of various controls. This is a commercial component suite but it comes with a free trial so you can see if it works for you before purchasing. The components should also work in Delphi XE5 and AppMethod. All of these components run on all four platforms with a single codebase. Head over and check out the full feature list for the TMS Pack for Firemonkey component suite.